Paperbasket - I like this paperbasket. Anyone knows of a resource for a similar one? Hey hey, i've seen similor ones but without the handles at House Doctor. It's Danish. 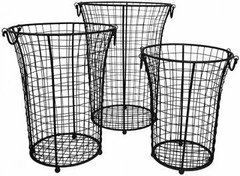 Try Googling "round wire basket with handles" and look at the results under the Images tab. Lots of choices. The one in the original picture looks like it's from R&Y Augousti. You can buy their line at Barneys New York. I love the console. Where can I purchase it? Turn into a wastebasket This good looking pair is holding some natural treasures (another option), but I think the size could also work quite well as a bin in the home office or bedroom. Another idea? Clip the handle and create a DIY Platner with a round piece of glass on top. Here's another beautiful example of how a black-and-white base palette ties together seemingly diverse items into a collected look. Console. Consoles are often found in hallways, and hallways are a great spot to have a little fun with decor. A console in glossy paint will add a little eye-catching pizzazz for those walking through. 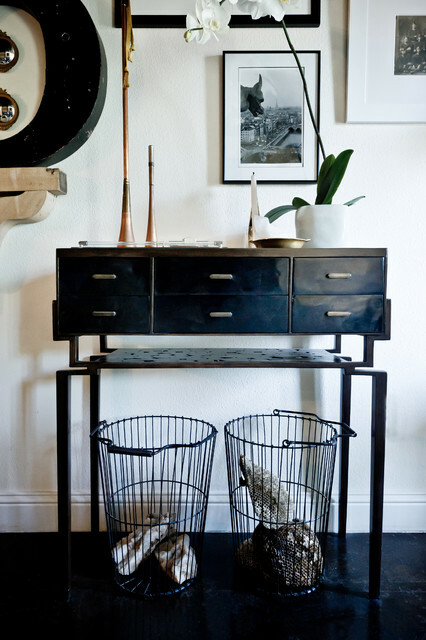 Wire-frame baskets, black and white art and frames, and a black table give the same high contrast without losing the warmth. This is a perfect example of the relationship between art and the other elements in a space. With the strong black console and wall sculpture, the composition needed a little negative space to keep from reading as too heavy. Yet a single photo or painting centered over the table would have looked lost. The solution? A group of several works arranged in a way that creates fluidity and leaves breathing room, but still holds its own.